Voices of the Future, a program developed by the National Speech & Debate Association, is designed to encourage student involvement in democratic society using speech and debate skills inside and outside the classroom. Voices of the Future teaching tools and activities engage students in the four zones of literacy: reading, writing, speaking, and listening. Students are enabled to think critically, collaborate, and communicate creatively. For 2015-2016, Voices of the Future will focus on the 2016 presidential election cycle. The included resources are available to any teacher or coach and cover how to host a watch party with built-in activities, pre and post debate teaching tools, and more. 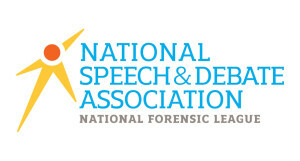 The National Speech & Debate Association connects, supports, and inspires individuals and schools devoted to giving middle school, high school, and collegiate students access to speech and debate. Together, we give youth a voice.